Now you can own your very own piece of vintage art as the Image Resource today launch an extensive collection of artwork and interior accessories. Encompassing images as diverse as bookplates, paintings, illustrations and vintage photography the range is available to buy online from Image Resource. Each stunning piece conveys a passion and artistry rarely seen. There is a special focus on antiquated imagery, with pictures that have been painstakingly colour corrected, sometimes removed from their background, and generally improved until they offer incredible expressiveness and power. 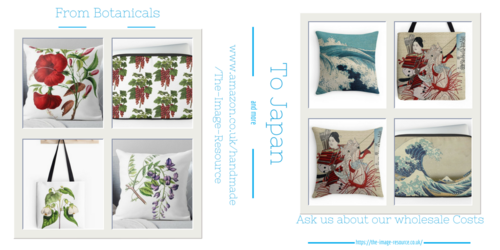 These fantastic works of art are available in a multitude of formats, from framed prints to laptop skins, printed cushions, toilet bags, travel mugs, pencil cases and tote bags. • A range of repeated graphic patterns titled ‘Kaleidoscope’. • A selection of bookplates from vintage children’s stories.